Hello Vlad, thanks for your comment! Well, if promises were just about solving the callback hell, then (no pun intended) they would be certainly a failure: you still have some level of indentation and they slow down performances. As stated in the post, the reason why promises are something different that cannot be achieved with callbacks, is that they are mostly about having a few of the biggest benefits of synchronous functions in async code: function composition and error bubbling! By the way, almost all promises libraries allow to aggregate simultaneous calls into a single promise, whose then function is executed when all promises have been either fulfilled or rejected. 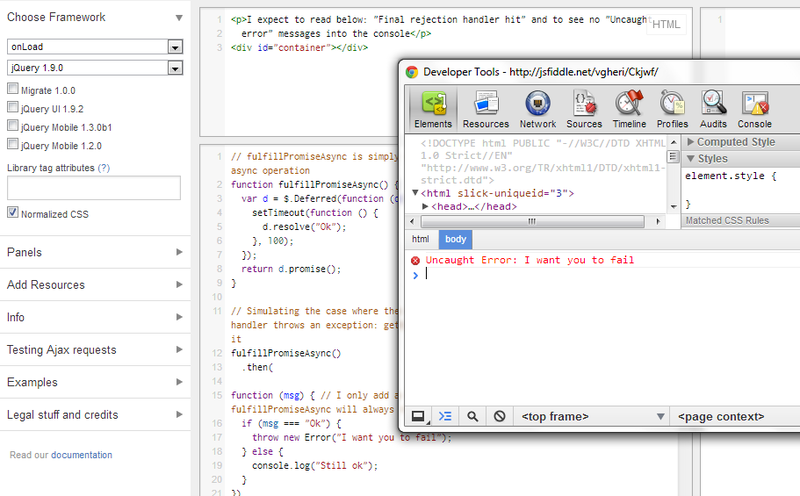 It’s important to realize that jQuery after 1.9 is still broken in terms of its error handling. Thanks Domenic for your comment, I’ll update the post as I have the time! I learned about this issue while watching a Domenic’s talk on youtube some time ago, so today i googled it just to see if the problem had been solved in the meantime, and, nope, still there in jQuery 2.1.0. At this stage, why not using Sizzle.js directly plus a “correct” promise lib? I’ve checked that the problme still persists in jQuery 2.x, at least up to 2.1.3. However, on the 3.0 alpha release, it’s amended.